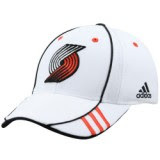 Blazers Hat Contest - Ariza-Fernandez Incident - Annoyed Yet? To enter, leave a comment with your predicted time. In order to win, you have to get the exact minute. Note here: don't leave your comment as "Anonymous" or you'll be disqualified. And only enter once. And if you haven't already, subscribe to our feed to find out about future contests. I'll go with 6:38pm! Go Blazers! 6:37, They'll lead up to it.